Sparkling green: wedding at Cenacolo Belvedere | Cosa Mi Metto??? Do you like the look I choose for the marriage of two friends of mine at Cenacolo Belvedere? Personally I love this long green dress! So here you are a series of pictures of this wonderful marriage!!! Vi piace il look che ho scelto per il matrimonio di due miei amici al Cenacolo Belvedere? Personalmente io amo questo vestito lungo verde! Ecco una serie di fotografie di questo meraviglioso matrimonio!!! i totally love the dress! That is such a beautiful dress, and I love the silver hole detail on it. You have a goodlooking husband and you look gorgeous together. You look fab..fabulosa! Your dress and complete outfit is adorably..the bride & vespa pics are so cute! I love the dress :* You are gorgeous! 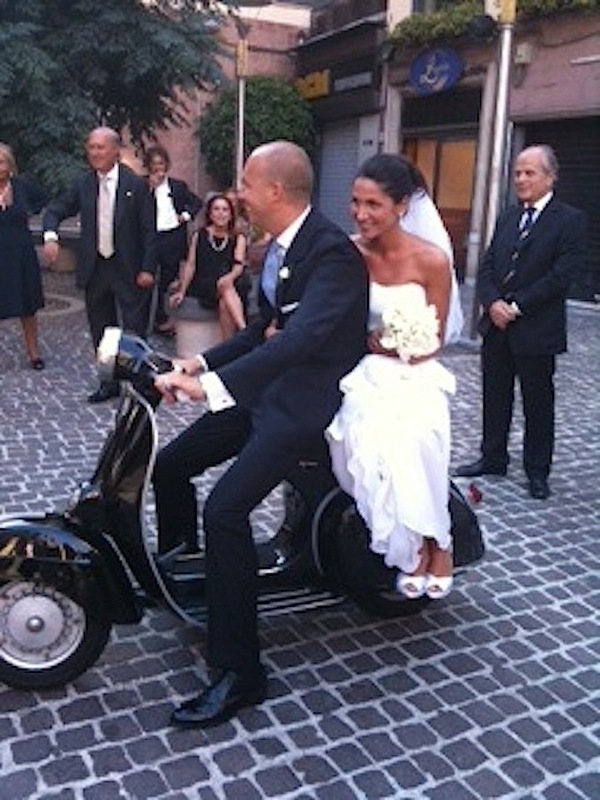 Bellissimo il colore del vestito, ma mi piace tantissimo l'abito della tua amica ed è carinissima la sposa sulla vespa! you look so elegant and pretty! love the dress! this is the third marriage you've visited this month, isn't it? Have a nice day and send us some sunrays to Bavaria please. i really like your dress!! so cute. beautiful wedding!! The dress has a really great color! Amazing pics !!! As always you look so beautiful !!! Your bag is just perfect !!! Love it ! You - a beautiful couple! Gorgeous, saturated color of the dress! Open areas of the body - a trend this season! Luxurious embroidery! Really amazing dress:) Great pics!!! Trovo che la tua Eleganza è Sublime, il tuo Look è una combinazione perfetta di colori e accessori. . .la tua è "Arte di Vestire" ! Complimenti . . . Cheers, your Look is as Shining as the Italian Sun! You look like a princess, great dress. Stunning! This colour is beautiful on you. Perfect look! I love the cut-out detail in the dress, and you and your husband make a lovely couple! Wow! Bellissima con questo vestito! i love your dress, bag, sandals, jewelss.... i love all!!! pretty dress you have ! you look stunning! I love your heels! You and your friend are LIKE top models!!!!WOW!! The bride is SO GORGEOUS!!! Loved the way they came on the scooter!! SO ITALIANO!!!! Bellissima la borsa e il vestitino! The dress looks beautiful on you. I'm following you now, follow me back?! Oh such a pretty wedding! You were lucking really pretty! Ok.. I must admit that all the girls looked great in your pictures lol. Great photos! I'm already following you via bloglovin. Please follow me back :) Thanks! You look absolutely fabulous! Great color dress! You look beautiful, and you have amazing shoes! lovely dress beauty! thank you for your comment, I follow you ;) Mua! Lovely dress! I love the color. WOW! you look beautiful ! i mean, that i can show my followers your blog, do you understand what i mean? You're pretty! This dress is awesome! Than you so much for the comment! I'd love to see you on my blog more often! Kisses! Sei splendida! Adoro il vestito e la clutch! I love Italy, i was there 7 times ! Very nice look :) Greetings from Poland! This dress is great :D.
Hi! You look very beautiful in this dress. Thanks for comment in our blog. We follow you :) Greetings! Great dress! You look amazing! Hi, thank U for your visit, your dress has a beautiful cut and color. so amazing! kisses! you look stunning! love this color and your nails match! so cute! You look fabulous. I love the color of your dress. Love the dress and what a lovely wedding! Lovely post and you look gorgeous! the girl who is married now does 2! The dress is simple but cute! You look amazing in this dress! Mi piace tanto anche il vestito della sposa: stava divinamente! Hey. Cool blog. I added to the observers and I hope the same thing. You look stunning! Love your dress, this is your color! hola! Thank you very much for your comment gave me much joy. I did a quick look at your blogs and I really liked what I saw. I follow you from this moment, and quietly and see your blogs with all the semicolons. You are my beautiful, we'll be in touch by commenting on the looks a big kiss from Seville. Lovely blog, with great photos! I'm ready to follow you, but it works both ways, right? Thanks for stopping by my blog! la maglia l'ho presa a marzo era della collezione primaverile di quest'anno , forse potresti trovarla in saldo c'era anche con lo sfondo panna e i bordi blu! uh io vado spesso a belvedere ^^ splendida come sempre!! what a gorgeous dress, you looked very beautiful! You look great. Your hair - this is fantastic. I like this. Your dress is amazing and it fits you really nice!! BELLISSIMA!! Questo vestito è stupendo!!! Mi piace molto tutto l'outfit!!! Hey. Great blog! I really like it here:) Yours + watch: D I hope the same thing! You look ravishing! The green dress looks splendid. I like what your friend, Giorgia, is wearing as well. Very cute! Your husband and you look adorable! Seems like you had a wonderful time! YOU LOOK BEAUTIFUL!! WHAT A BEAUTIFUL WEDDING!! It'snice to see a piccy of your husband. He is so handsome. Does everyone in Italy ride Vespa to their honeymoon? I love the dress and you look georgeous! I have the same nailpolish! and the bride's dress is aweosme! u'r so pretty, nice dress! I love your dress, this color really suits you! Hi hi, greetings from Poland. You are Italian, aren't you? I like your choice! Your dress is wonderful! An I also like the bridal gown, bride looks fantastic! that colour on you looks amazing! and loving the bride's dress! you look like serena on gossip girl. no va be sei meravigliosa! non aggiungo altro perchè le foto parlano! ti seguo su gfc ti va di ricambiare su gfc? omg you look so pretty ! i love your skin colour !!! It is nice to see you on my blog. And of course I follow you. PS. Thanks for visiting my blog, btw. Gorgeous look! I love the long green dress on your tan! The bride looks radiant too. Thanks for your comment on my blog. "See"each other around. Just Stumbled Across This Blog! (Following!) You All Look Lovely And Your Dress Is Gorgeous! bellissimo il vestito verde smeraldo. Adoro i long dress, soprattutto d'estate!! io ne ho preso uno a saldo di Pinko su fashionis. ce ne sono davvero di carini..facci un salto!! You are so beautiful ! this dress is wonderful ! Hi Fabrizia! Thank you so much for commenting on my blog! As I told you before, I'm already a follower of your blog on Bloglovin'. If you like my blog, you can always follow me too, any way you like. Great dress! Suits you well the green! gorgeous dress and outfit....now following, dear! these are such pretty pictures, your dress is so beautiful! and i have to say i loved the vespa! thank you for your comment, now following! ciao, posso sapere la marca del vestito? è stupendo!!! Il vestito non è di marca, io l'ho comprato in un negozio a Napoli che si chiama Le Soleil!